Just as the waning days of summer are winding down, my CSA delivered a cute little red cabbage. Raw and shredded and dressed with sweet clementines and currants makes for a perfect summer salad that is perfect for large crowds. The peppy dressing does not cover up the beautiful bold colors of this salad. If you have a food processor with a shredding and slicing disc, this really couldn’t be easier to make. Without it it’s pretty east too, so don’t worry – as a sharp knife will suffice. 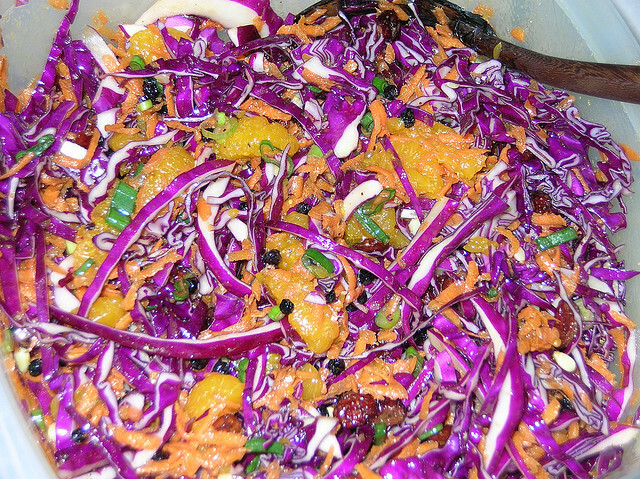 A colorful, crunchy purple cabbage salad that is accented with cranberries (or currants of your choice) and clementines, both of which are loaded with the disease-fighting antioxidants. It has a zesty, fresh personality and the citrusy dressing is quite a peppy blend, as well. This is one of my special occasion salads for large crowds; they always ask for more. Working over a bowl, peel the clementines, separate the segments and remove any white pith. Reserve any juice that falls into the bowl. Place the clementine segments, cabbage, pine nuts, carrots, cranberries, and scallions in a large salad bowl. Set aside. To make the dressing: in a cruet or jar with a lid, mix the brown sugar, oil, vinegar, juice, crushed garlic, salt and pepper. Close tightly and shake until all the ingredients are thoroughly combined. Pour the dressing over the salad, seal and toss to coat. Refrigerate For up to 1 hour before serving. I was in an epicurean culture shock when I first arrived in Tokyo at the age of nine to visit my grandfather, who had lived there for some twenty years as a rare pearl dealer. My parents wanted to expose me to Japanese culture, which included sushi, but I was not a fan of raw fish wrapped in lettuce of the ocean. I still remember looking down the street at rows and rows of restaurants in the Roppongi neighborhood, the epicenter of Tokyo nightlife, and spying not one Western eatery. Finally I succumbed to a Japanese restaurant and we ordered a carrot ginger salad. That was my first introduction to this delightful Japanese condiment. Years later, I discovered from Good Housekeeping magazine that this dressing, typically served on lettuce greens, fuses well with the South America grain, quinoa. To save on time and pots, you can steam the broccoli in a steamer basket on top of the bubbling quinoa in a rice cooker. While you wait for those two to cook, a food processor or blender makes quick work for the warm orange colored dressing that clings so well to the quinoa. The sharp flavor of the ginger is rounded out by the toasted nutty sesame oil and soy sauce, and mellowed by the sweet ground carrot. Serve warm or at room temperature. 1 Pour the quinoa into a sieve and rinse it under cold running water. In a saucepan, combine the quinoa, 3 cups water, and 1/2 teaspoon salt and heat to boiling over high heat. Reduce the heat to low; cover, and simmer for 20 minutes, or until the water is absorbed. Transfer the quinoa to a large bowl. 2 Meanwhile, fill a medium-sized saucepan with enough water to come 2 inches from the bottom and set over medium-high heat. Place the broccoli in a steamer basket, and when the water boils, set the steamer on top of the saucepan. Alternatively, place the broccoli directly into the nearly boiling water. Cook, covered, until the broccoli turns bright green and is crisp-tender. Add the broccoli to the quinoa. 3 In a food processor, combine the carrot, ginger, oil, vinegar, soy sauce and sesame oil and process until puréed. Add to the quinoa and broccoli and toss to combine. Serve warm or at room temperature. Cook’s Note – Another alternative is to combine the quinoa with water and salt in a rice cooker and use the steam basket that comes with the rice cooker for the broccoli. Nothing like cooling off on a hot day with a cool refreshing cucumber salad. These variation of cucumbers are the long ones… almost a foot long and longer and it yields so much for this salad. You can prepare this ahead of time and refrigerate until ready to use. The easiest way to slice the cucumbers so your hands don’t tire from all that chopping, is with a food processor fitted with a metal blade. This is a perfect ornamental salad when you have guests to be placed into a clear tall glass vase. 1 Sprinkle salt over cucumbers. Mix and let stand for 1 hour. 2 In a small bowl, mix and combine vinegar, sugar and garlic. Set aside. 3 Place cucumbers into strainer and squeeze gently to discard any liquid. 4 Mix cucumbers with red pepper. Pour dressing into bowl and combine with parsley.